I'm here to share the truth about chicken treats. The truth as I see it, at least. And here's how I see it. Is feeding your chickens too many treats harmful to their health and production rate? Should treats be fed in moderation? Should treats be varied and healthy? Does giving your chickens treats make you both happy? And the answers are yes, yes, yes and a resounding YES!!! Sure, commercial chicken feeds are scientifically balanced to provide your flock everything they need to be optimally productive. Scientists know exactly how much of it a chicken needs on a daily basis. They've got the exact right balance of nutrients, vitamins and minerals your chickens need down to, well... a science. And let me tell you...it's a delicate balance. 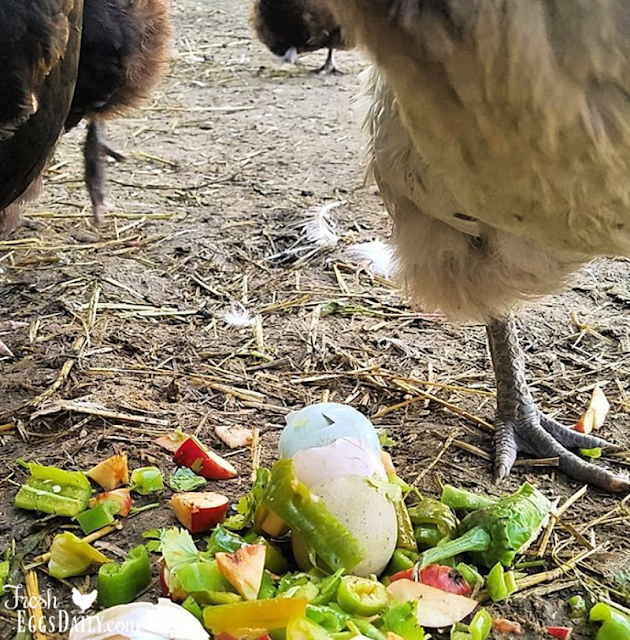 For chickens maybe more than other types of animals, their diet is critical to overall health since they expend so much energy and put so many nutrients into their eggs. The second your chicken steps out of the coop, nibbles on a few blades of grass, pulls a worm out of the ground, munches on a few basil leaves from your garden, beheads a marigold and then snacks on four beetles and a slug, that "delicate, scientifically calibrated balance" goes right out the window. So, really? We're going to worry about treats? Even the commercial chicken feed companies agree that allowing your chickens treats in moderation is not harmful. In fact, many even SELL chicken treats! 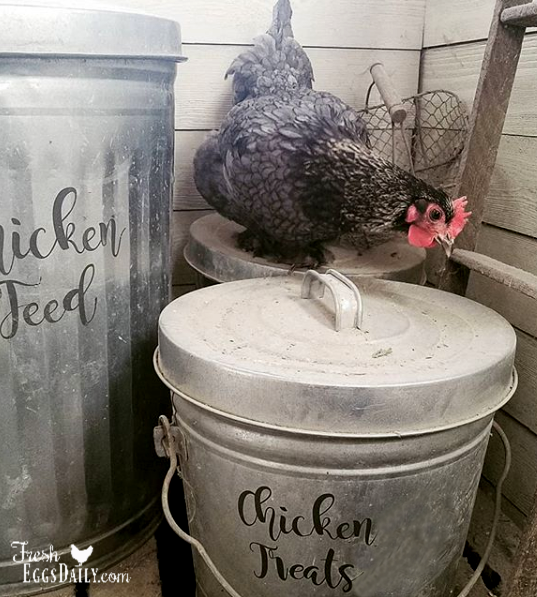 One of the huge benefits of raising chickens, in my opinion, is their skills as mini composters. Instead of tossing out kitchen leftovers and garden trimmings, the chickens get them. 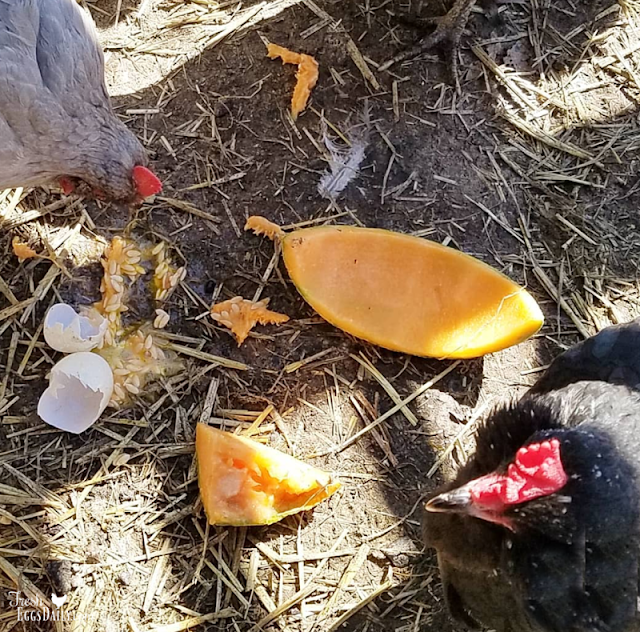 They digest it all, poop it out, and in return provide us with beautiful manure for the garden and delicious fresh eggs. 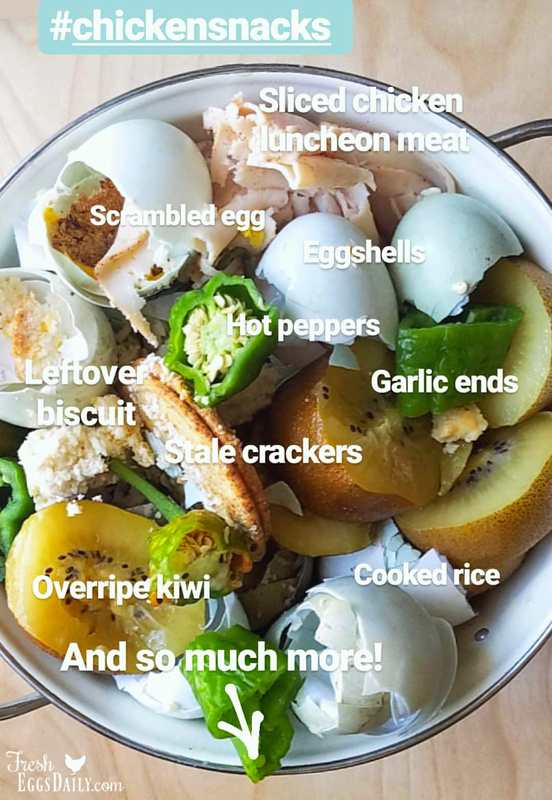 My grandmother used to keep a bowl on the kitchen counter next to the sink and would toss in tips, and ends, and scraps and leftovers as she was cooking. My Mom did the same for our chickens when I was growing up. And I do the same. 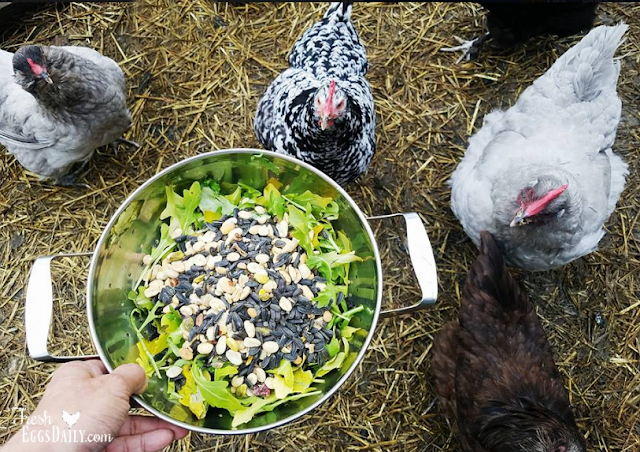 I do try to give my chickens mostly healthy treats for the most post. Whole grains, lean meat scraps (yes, chickens happily eat meat, fish and shellfish), veggies and fruits. 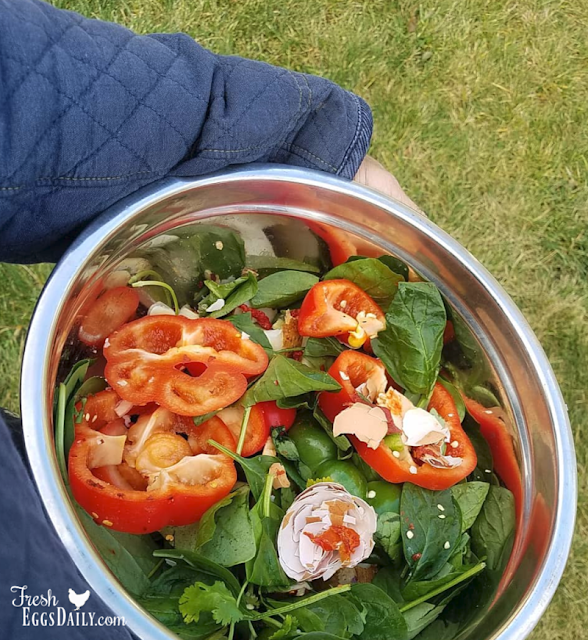 I've always said the healthier your family eats, the healthier your chickens will eat! 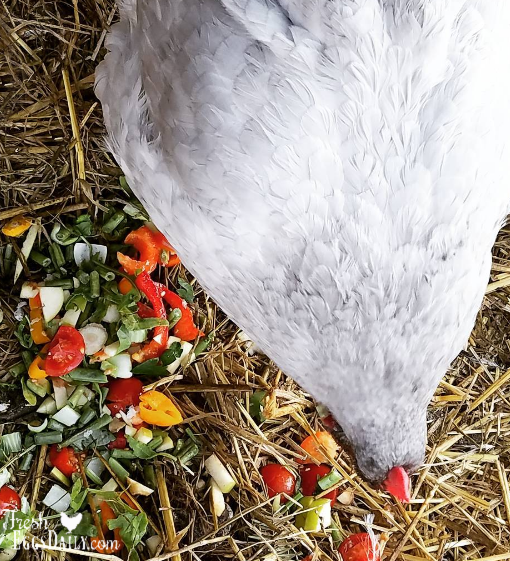 Now, you might have read that there's no way chickens can actually enjoy treats because they not only don't have nearly as many taste buds as humans do, they generally swallow their food whole, so it doesn't spend too much time in their mouth before it hits the crop. So they can't really be differentiating between the taste of one food versus another. But there's faulty reasoning at work here. If you honestly don't believe that your chickens prefer one snack over another, or don't get excited about treats, you've never seen a rooster do his "happy dance" for the hens when he finds a tasty bite to eat, or seen a mother hen's clucks rise in intensity when you give her and her chicks some cracked corn or another delicacy. While it's true that chickens don't have a very developed sense of taste, they actually use their eyes to find and identify tasty treats. It might surprise you to learn that chicken eyesight actually surpasses even human eyesight. I also believe that preference for one type of food over another develops when they're young. This past spring I raised three separate batches of chicks under different mother hens. One batch was being brooded during strawberry season. I shared strawberry tops often with that batch. My broody hen taught her chicks that they were good to eat. The second was brooded during the time that our rose bushes were blooming, and as a result, that group got rose petals as a frequent snack. The third batch was being raised during raspberry season, so, yup, you guessed it, they enjoyed raspberry snacks. 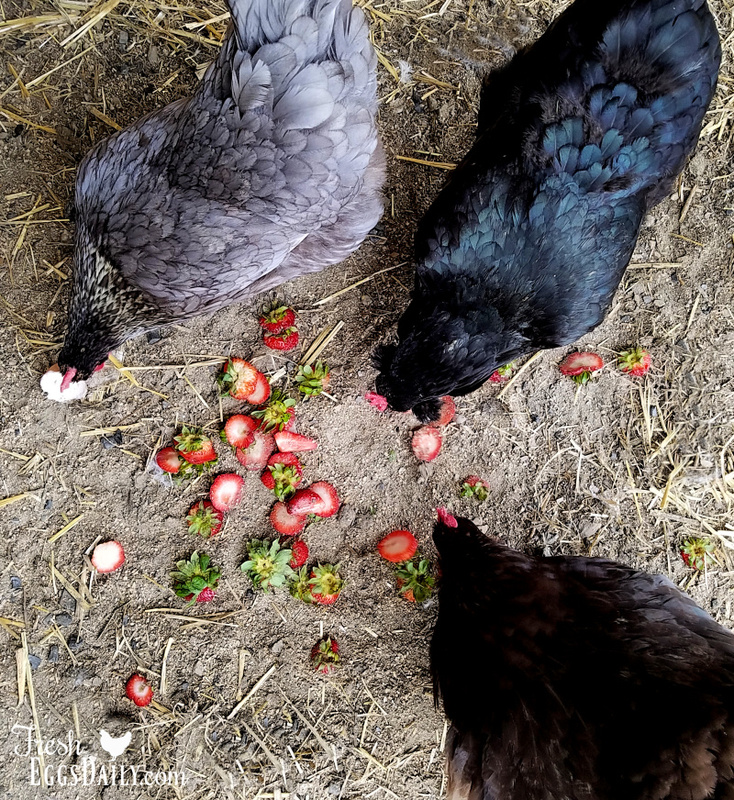 Subsequently, I have noticed that when I make strawberry shortcake, the batch of chicks who were raised eating the strawberry tops are the first to come running when I have some to share. The others tend to hold back until they see others eating them. Same with the raspberries. With a freezer full of raspberries, I continued sharing them with the chickens well into fall and that batch of chickens who learned they were a good snack from their Mom as chicks are the first to dive into them. 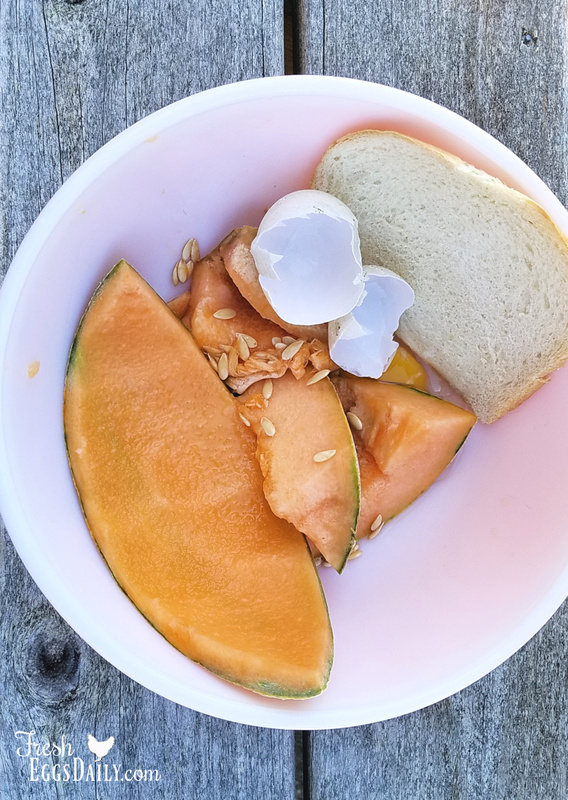 Supplementing your chickens' diet with healthy snacks is not only beneficial for us and makes us feel good, it's also good for our chickens. I don't know about you, but my goal in chicken keeping is not to have my girls pump out the maximum number of eggs. Sure, I want them to be healthy, I want them to live long lives, but if they lay a few less eggs, I'm okay with that. I truly believe that they enjoy a varied diet, and I believe a varied diet provides them all kinds of additional nutrients. No food goes to waste in our house, and I have my chickens to thank for that. I fully intend to continue to feed my chickens a healthy diet that includes daily treats. Yes, I limit those treats to about 10% of their diet. Yes, I try to feed mostly healthy treats. And yes, I think my chickens enjoy them. Oh, and our oldest hen just passed last February right after her ninth birthday. She laid eggs until she was about six years old, fairly regularly, and she was raised on a daily diet of layer feed and healthy snacks. And yes, she enjoyed warm oatmeal in the winter. How Many Treats is Too Many?